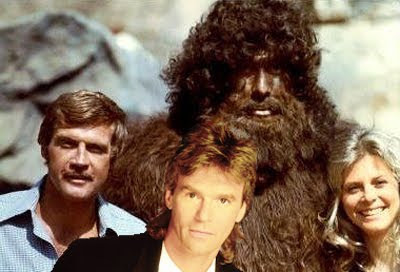 Bigfoot News | Bigfoot Lunch Club: Austin and Sommers have met Bigfoot, but MacGyver? Austin and Sommers have met Bigfoot, but MacGyver? Bigfoot's appearance in the The Six Million Dollar was so popular they made an action figure out of it and then included it the sister series Bionic Woman. We have never done a post on either of these episodes, because we were waiting for just the right occasion. What occasion did we pick? The surfacing of the MacGyver episode with Bigfoot. And while we are reminiscing about cheesy shows with Bigfoot here are the two bionic clips from Six Million Dollar Man and The Bionic Woman.